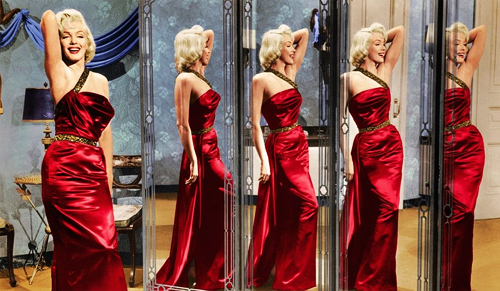 My dress is heavily inspired by a dress Marilyn wore in How to Marry a Millionaire, designed by her favourite dress maker William Travilla. Although the colours in the above image aren't the true colours of the actual dress, see below for the original dress. I really liked the deep red mixed with gold. A group of people told me that i looked like a movie star! Oh darling one does try! I could wear cocktail dresses every day. There should be more opportunities in life to dress up and 2013 i am going to make those opportunities! You do indeed look like a movie star, stunning! I wish I had a pub next door, sounds fab to just pop round when you fancy it. I am glad you went out, that dress deserves to be worn on a big night like last night! You are such a fabulous seamstress. You look so very glamorous at your event. You look amazing! I'm glad I found your blog! Following now! You did an amazing job making that dress. What an inspiration! !